Selecting the right solution is just the beginning of the journey. Whatever outcomes you’re seeking—quality improvement, increased engagement, better adoption, increased efficiency—our experienced experts can help. Our experts combine Healthwise innovation, health education best practices, and solution integration to help you achieve your unique goals. We’ve worked with health care organizations to craft detailed recommendations for strategy initiatives and expansion roadmaps that deliver real business impact. Partner with our highly skilled team to connect to the newest Healthwise technology and product specifications. We’ll help you align the affected IT infrastructure to streamline processes, increase user adoption, and integrate legacy systems with new solutions. With over 40 years of health care industry experience, we are your holistic partner in your health education journey, with engagements ranging from full implementation to strategic advisory services and program design. Transformation is no small feat, so we think and deliver big. What do you want to achieve with Healthwise in six months? In two years? Tell us where you want to go and we’ll do everything possible to make it happen. We work with you to clarify what you want to do and how it fits in your overall strategy, to set priorities, and to decide how to measure results. Then we help design a plan to make it happen. When it comes to implementing Healthwise, it’s not “one size fits all.” The solution must fit within your system, your technology, and your workflows. We’ll help identify all your impacted integration and touchpoints so they’re planned for and help you get maximum value from your Healthwise solution. This isn’t a “one and done” relationship. We’re there anytime you need to refine, reset, or amplify. 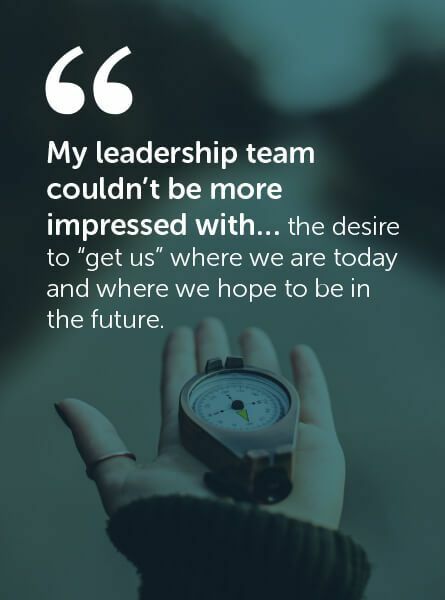 We can assess progress, evaluate adoption and performance, and measure satisfaction and effectiveness—all with an eye to the challenges in your organization today and the opportunities of tomorrow. Save time and minimize disruption by taking advantage of our knowledge. When you choose us, you get our expertise and the experience of the hundreds of organizations who use Healthwise. While your implementation will be unique to your organization, many aspects can be informed by best practices. Draw on others’ experience to shorten your learning curve, avoid missteps, and produce faster results. We work with organizations of all types and sizes with a wide range of ideas and implementations. We share what we’ve learned so you can enhance your implementation by borrowing from proven methods to generate new, enduring, and evolving value. Change can be scary and rife with risks. We help you plan for change and then skillfully manage it to minimize disruption to your organization and staff. If you’ve been burned in the past by lengthy, laborious implementations, take heart. Partnering with Healthwise gives you a whole new team of experts committed to setting your team up for success. 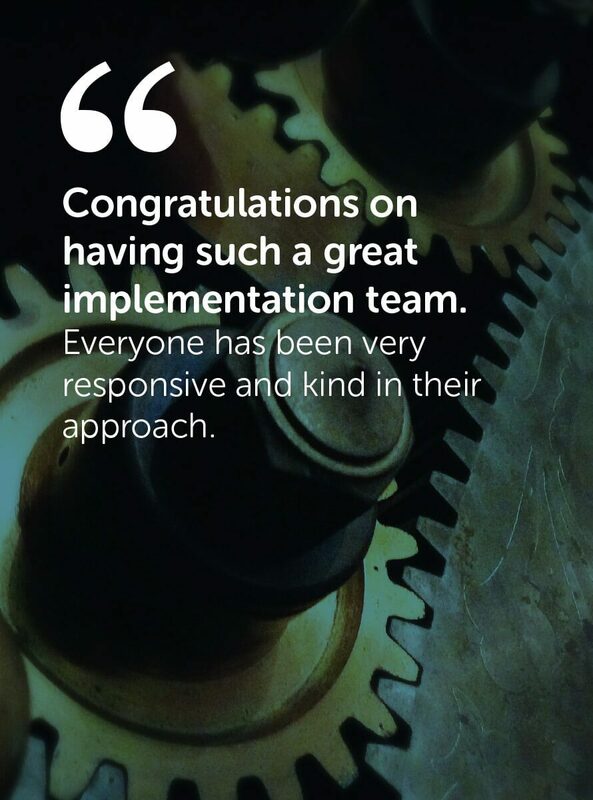 With our proven methodology and repeatable process, we’ll get your implementation done, and done well. We don’t just deliver the solution. We’re there to make sure it’s easy for your people, fits in your processes, and integrates with your technology. You want a solution that’s optimized to deliver a high return on investment for your business. We want to get you that solution as quickly as possible. Get immediate access to experts so that any bumps you encounter are quickly knocked down. You don’t have to figure this out on your own. Our training will help your staff understand the benefits of the solution and use it effectively to meet your objectives. This isn’t just a contract or project to us—it’s an ongoing relationship that we’re committed to because we measure our success by your success. That’s why all our customers receive a robust level of support, software upgrades, content updates, and enhancements. We’re continually enhancing our products based upon your changing needs and feedback from users. We act on hundreds of requests every year for content additions and enhancements from our clients. We measure ourselves by how well we do for you. With your input to our frequent customer surveys, you help improve Healthwise solutions, services, and support. Delighting our clients is a key goal for our entire company every year. 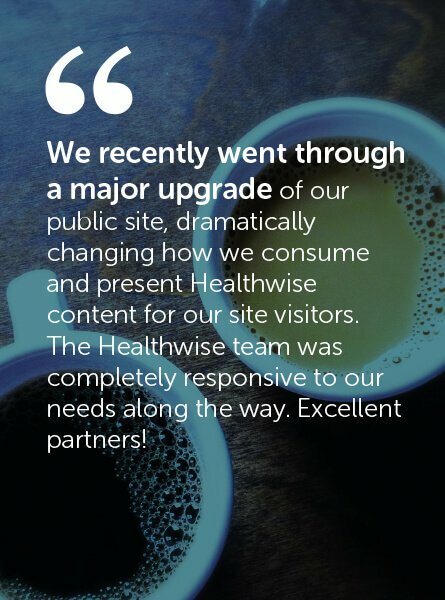 Whether it’s taking full advantage of a new release of our solution, or a big change in your business priorities or technology, we’ll ensure you continue to get full value from your Healthwise solution. "Amazing! It is an absolute pleasure to work with the staff at Healthwise. Working with them is a dream—they are professional, responsive, dedicated, and really just so personable. It feels like a team, not a client and vendor." 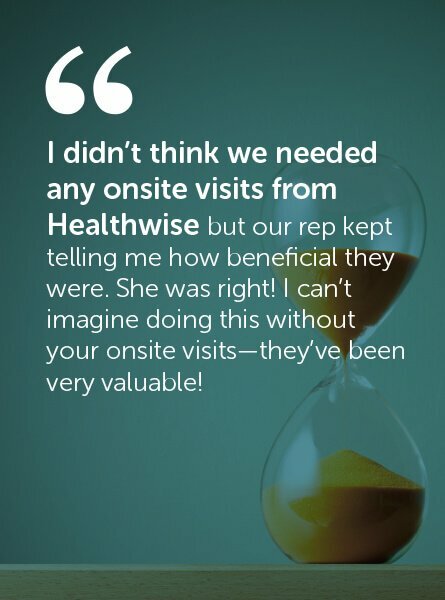 Find out how a health plan in the Southeast got up and running with a stand-alone version of our Healthwise for Care Management solution within just 2 months! Personalized service, expert consultation, and periodic reviews. 24/7 access to our client portal. Online and phone support for technical issues and how-to questions. View status, progress, and history on support requests online, at any time. Ongoing education, release notes, access to resources, promotional material, and webinars. Ability to submit content and enhancement requests. Do you have a vision for transforming your business but don’t know how to make it reality? Find out how we can help.